At the NACADA Annual Conference in St. Louis this past October, the members of the Board of Directors asked NACADA general membership to participate in a series of discussions on various topics during the Town Hall event. NACADA had over 150 members participate in these discussions. Over the next year, the Board of Directors will be utilizing this information to inform our work. As a board, we are also working on plans to share the information, answer questions, and address concerns. The Board plans to offer three additional virtual Town Hall meetings over the next several months to share information with NACADA members and to allow for discussion from members unable to attend the Town Hall in October. In this and future “From the President” Academic Advising Today articles, I will also be selecting various topics and addressing them. In addition, the Board has sent several of the suggestions to various committees and commissions to guide their work. The Board also noticed during the Town Hall meeting in October that some of the questions raised already have answers, but it became clear we need to find additional avenues for communicating this information to our members. I have started brief email updates on Town Hall information. The Board received so much information, that to incorporate all of it in one document felt overwhelming to read or process. These emails do not prioritize the information, but rather are addressing items that already have answers. Please keep in mind that many suggestions involve more comprehensive work and review, but I do want you to know that we are looking at every idea presented. One request made in the October Town Hall meeting was to share more information regarding our demographics. This was a great suggestion, as NACADA is continually striving to make sure our leadership is representative of our membership. 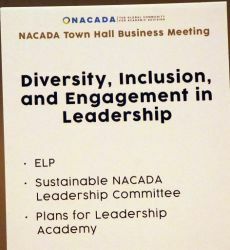 The Inclusion and Engagement Committee has a report compiled every year that documents NACADA Member/Leader Representation. As NACADA addresses inclusion, we view diversity in a broad sense to ensure our membership is represented in a variety of population areas such as ethnicity, gender, institution type, advising role, and years in advising. I understand that to some this appears to create a broad statement of diversity; however, we need these different population areas represented in leadership to speak for the two year colleges and the private colleges as well as gender and ethnicity concerns. The following charts compare leadership numbers to the make-up of the membership after the 2017 election (NACADA, 2017). While some of these numbers are encouraging, they do show that we still have work to do in creating a representative leadership team. At the annual conference, I put a challenge out to our membership to think more intentionally about nominating members for leadership positions and then to encourage members to run for positions if nominated. My concern continues to be the large percent of those nominated that do not run. In the 2015 election process, 43% of those nominated actually ran on the ballot, and in the following two years the percentages were at 66% and 54%. I am encouraged by the increased number of nominations for this year’s election cycle, which concluded on October 31. There were 117 nominations this year compared to 99 nominations last year. The slate of nominations is fairly close to our NACADA membership profile; however, we as a NACADA membership still have work to do in some areas. Now our work as a NACADA collective should focus on supporting and encouraging those nominated to actually run on the ballot. Further work from the Board is also needed to review how our membership profile reflects professionals in the field of academic advising. The Board of Directors has established a sub-committee to look at why members do not run for leadership positons. They are looking at our NACADA bylaws and the election process to see if we unintentionally create unnecessary roadblocks to leadership. Another NACADA task force is establishing guidelines for a leadership support fund to provide financial support for candidates from underrepresented populations that cannot secure institutional financial support to run for leadership positions. In addition, the Sustainable Leadership Committee is finalizing plans for a Leadership Academy to provide support for future and current leaders. 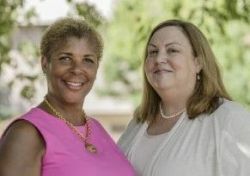 All three of these projects are in support of two of our strategic goals: (1) Foster inclusive practices within the Association that respect the principle of equity and the diversity of advising professionals across the vast array of intersections of identity, and (2) Develop and sustain effective Association leadership. In response to the requests to share more updates on the Association, the Board is rethinking the format of our annual report. We will be creating a new format that will include additional demographics and updates on the year’s activities from the various Divisions, the Council, and the Board of Directors. NACADA leadership is willing to share information, but we struggle to disseminate this information in a concise manner that is useful to our members. I would like to close by encouraging you to get engaged with the Association through one or more of the many opportunities available. Please review the three divisions and learn about the opportunities in each area. All region, committee, and advising community (previously commission and interest groups) meetings are open meetings. I encourage you to attend the meetings and join the area, where appropriate, to gain additional information and to add your voice to the discussions and prepare for a leadership position in NACADA: the Global Community for Academic Advising. NACADA: The Global Community for Academic Advising. (2017). NACADA Member/Leader Representation. Manhattan, KS: NACADA: The Global Community for Academic Advising. A Life of Service to NACADA, Our Profession, and Students Across the World: Virginia Gordon aka "The Boss"
The two-year program will be offered to higher education institutions nationwide, beginning with an inaugural cohort that will be guided through an evidence-based decision making, planning, and implementation process to improve their academic advising efforts. Institutions selected to be part of the inaugural cohort will engage in an institution-wide initiative using NACADA and the Gardner Institute’s nine “Conditions of Excellence in Academic Advising.” These standards acknowledge the role of academic advising in promoting student learning, success, and completion as well as the complexity of higher education and organizational change. NACADA and the Gardner Institute, along with the initial group of institutions, will refine, validate, and establish the aspirational standards for colleges and universities to evaluate and improve academic advising. The process draws on NACADA’s academic advising audit experience and is enriched by the Gardner Institute’s success in guiding institutions toward systemic change and improvement in student success. Formal consultants’ reviews and guidance will support the development of a set of evidence-based institutional recommendations for change, as well as provide support for plan implementation. Beginning in the late fall, NACADA will host a series of free informational webcasts to provide additional information about this groundbreaking project. NACADA is a global association of professional advisors, counselors, faculty members, and administrators working to enhance the educational development of students in higher education through research, professional development, and leadership. The Gardner Institute is a non-profit organization dedicated to partnering with colleges, universities, philanthropic organizations, educators, and other entities to increase institutional responsibility for improving outcomes associated with teaching, learning, retention, and completion. Each year the question of whether or not to implement mandatory advising seems to surface across a variety of venues and mailing lists. Those asking the question seem to be looking for a determination of good versus evil, or helpful versus damaging. Is mandatory advising the secret missing ingredient? Should campuses do it or not? Will it actually help students? In many ways, it parallels the ever-elusive and mysterious advisor/student ratio, debates of centralized versus decentralized advising structures, and discussions of faculty versus staff advising for students. All cases innocently seek simple answers to what are, in actuality, very complex questions. Campuses that initially take a binary approach to the question of mandatory advising fail to address a more important question: “What vehicle does the campus have for helping students meet desired advising outcomes?” In addressing this question, campuses must be able to answer other questions about how they meet student needs. How do faculty and staff help scaffold the complexity of the institution with concrete tools, guidance, and support delivered at appropriate intervals? How do institutions help students make a personal and consistent connection with a staff or faculty member who cares about their success throughout? How do campuses ensure that students are being connected to appropriate resources, experiences, and mentors appropriate to their chosen goals at appropriate times? Of course, these questions will vary based upon specific desired campus advising outcomes which need to be determined before discussing the broader question of operationalizing these outcomes, but the idea remains the same. When campuses pose this essential outcomes-based question, they strengthen their ability to conceive the most integrative and holistic solutions for ensuring that students can achieve desired advising outcomes. Some campuses, for example, have highly integrative first-year curricular offerings for all students where faculty and primary role advisors work together to spark intellectual curiosity, make important connections, provide tools and reflective experiences to improve academic skills, and introduce advisors as key educators to help students navigate a highly complex and multifaceted journey involving curricular and co-curricular components. Other campuses have a required introductory general education course that has discussion components specifically focused on achieving advising outcomes. Others have found success by embedding advising outcomes across several first-year course sequences. Some have approaches that combine coursework, specific mandatory check-in points, and data analytics to help identify students in transition. These few examples illustrate some potential approaches to integrating advising learning beyond the dualistic mandatory context frequently presented. While some campuses have the capacity to implement highly integrative approaches, many have structural limitations to an integrative first-year sequence or other delivery vehicle for students to achieve essential advising learning and outcomes. A mandatory advising approach may, in fact, be the best option for a particular campus to achieve campus designated outcomes. Research can serve to provide guidance. One comprehensive study found that students favor required academic advising. Conducted across multiple institutions and institutional types (n=22,300 students), the study used a 6-point Likert-type scale where 1 represented “strongly disagree” and 6 represented “strongly agree” to collect responses to the statement, “There should be mandatory academic advising for all students.” The mean was over 4 from students who currently receive no advising and over 4.5 from those regularly advised (Smith & Allen, 2014). Students who have never been advised say there should be mandatory advising and those who have been advised say it even louder. Research also points to having students meet with advisors regularly, and seemingly, the more frequently the better. One study found that students who report speaking with an advisor either “sometimes” or “often” had significantly higher persistence rates than those who did not (Klepfer & Hull, 2012). Another study found the number of advisor meetings to be a significant predictor of persistence for first generation students where each meeting with an advisor increased the odds of persistence by 13% (Swecker, Fifolt, & Searby, 2013). The more frequently a student meets with an advisor, the higher a student’s self-efficacy, study skill utilization, and perceived level of institutional support (Young-Jones, Burt, Dixon, & Hawthorne, 2012). Similarly, students with more frequent advisor meetings report increased satisfaction with advising and the institution as a whole, as well as higher self-reported levels of learning across a variety of advising learning functions (Smith & Allen, 2014). This pertinent research indicates that positive student outcomes result from regular meetings with advisors. Mandatory advising is one of several vehicles likely to produce positive outcomes for students; however, within the context of an institution’s existing structure, curriculum, and ecosystem, there may be much more powerful and creative ways to meet students “where they are.” I would encourage a full exploration of possibilities before embarking on the complex and potentially expensive decision to implement mandatory advising—and to do so by considering the question, “What vehicle does the campus have for helping students meet desired advising outcomes?” As the saying goes, “students ‘don’t do’ optional,” and if there is no curricular or co-curricular vehicle to ensure students are able to access crucial advising learning, then based upon the limited research to date, it would certainly appear that mandatory advising should at least be considered as one potential vehicle. Now, how to effectively implement mandatory advising can be an even more complex question. If your campus is wrestling with some of these decisions, I would encourage the many NACADA resources available to your campus including the NACADA Consultants and Speakers Bureau, the NACADA Clearinghouse, and the many NACADA institutes where specific teams from your campus can work with NACADA experts on tackling these difficult questions. Smith, C. L., & Allen, J. M. (2014). Does contact with advisors predict judgments and attitudes consistent with student success? A multi-institutional study. NACADA Journal, 34(1), 50-63. Swecker, H. K., Fifolt, M., & Searby, L. (2013). Academic advising and first-generation college students: A quantitative study on student retention. NACADA Journal, 33(1), 46-53. Young-Jones, A. D., Burt, T. D., Dixon, S., & Hawthorne, M. J. (2013). Academic advising: Does it really impact student success? Quality Assurance in Education, 21(1), 7-19. From a social psychology lens, the situation is a classic example of in-group out-group behavior and cognitions (e.g. Tajfel, 1982). People have a tendency to stereotype those who are not in their group, and the stereotype often includes negative biases. Learning more about the out-group (in this case student-athletes) can humanize them and break down the assumptions of their undeserved privilege. Those who specialize in advising student-athletes need to make sure their advisees learn more about the culture of college outside of the world of sport so that the student-athletes modify their behavior (e.g. email outreach to professors and other advisors) to improve lines of communication. For those inside the world of collegiate athletics, and perhaps especially for students participating in Division I athletics, “coach says” is a very compelling justification for a behavior. Outside of athletics, this phrase is more likely to raise hackles than create cooperation, especially among those who are not familiar with the daily lives of student-athletes. The informative interchange with an advising colleague described above reminded the authors that not everyone is on board with the goal of working to optimize advising services for student-athletes. This article aims to show that when communication improves across silos, or separate entities on college campuses that rarely interact, it might increase empathy for the student-athletes and facilitate simple programmatic changes that could increase the likelihood of student-athletes successfully completing the degree programs that they would ideally like to pursue. Janice Stapley and Vonetta Kalieta (2017) conducted individual interviews with 18 female student-athletes in their lab to get insight into their everyday life and their perceptions of the culture of student-athletes. The participants shared that they are very happy with the social support and companionship of teammates, especially during their first-year transition to college. However, student-athletes reported that they were stressed by over-scheduled days (including lifting and other training, team meetings, practices, mandatory study halls, and competitions that often include travel). Beyond the stresses from juggling their schedules and sometimes not even having time to eat regular meals, they mentioned that professors sometimes do not understand their limited free time and assume that they could attend scheduled office hours or extra credit events if they really wanted to go to them. Thus, one important outcome from better communication across different departments is that student-athletes’ lived experience will be better understood by constituencies across campus. Since their schedules are so packed with obligations they need to fulfill for their sport, student-athletes need perquisites like priority scheduling. Student-athletes can be supported in their quest for a meaningful education through collaborations on their behalf across the university, including support for their pursuit of a bachelor’s degree in their chosen field by the Director of Athletics, Athletic Department Advising, academic advisors in their major and minor departments, first-year advisors, and faculty who are cognizant of their schedules. One way the Athletics Program at the authors’ Division I private university tries to facilitate communication is that student-athletes are required to hand in travel verification forms to their professors during the first week of each semester. These forms show the student-athletes’ travel schedule for the full semester. This not only helps inform the faculty member of their schedule, but also helps break the ice between faculty members and student-athletes. The professor and the student-athletes can discuss whether the number of absences is likely to have a devastating effect on the student’s success in the class or whether the travel schedule is something that can be readily accommodated. Ideally Athletic Directors set the tone by valuing student-athletes’ choice of major so that everyone involved gets the message. Although past literature has shown a tendency for “major clustering” in student-athletes (Schneider, Ross, & Fisher, 2010), this does not have to be the case. The 18 female student-athletes Janice Stapley and Vonetta Kalieta (2017) interviewed included students from eight different majors—including Psychology and Biology that both have many lab courses. However, without communication between Athletics and Department Chairs who schedule classes, colleges may unknowingly offer required major courses at times that are impossible for student-athletes. Thus, in order to play their sport and for many student-athletes, maintain the scholarship that allows them to attend college, student-athletes might have to abandon the major that they hoped to pursue for another course of study that is possible within the time constrains of athletic participation. But, if Department Chairs understand that they are preventing student-athletes from declaring their discipline for a major due to required courses or labs on Friday (due to travel for competition), they can modify the times that central courses are offered. Thus, besides the tone being set at the top, the communication between the different departments allows Department Chairs to schedule classes that fit within the time constraints of student-athletes’ schedules, advisors to be aware of the time constraints of sports participation, and faculty to understand that events scheduled outside of regular class time are rarely possible for student-athletes. Thus, college personnel should work together to provide the best possible educational opportunities and create a culture in which in which all student-athletes, even those in Division 1 programs, can double major or choose a major in science or art that has labs and studio schedules that are challenging. 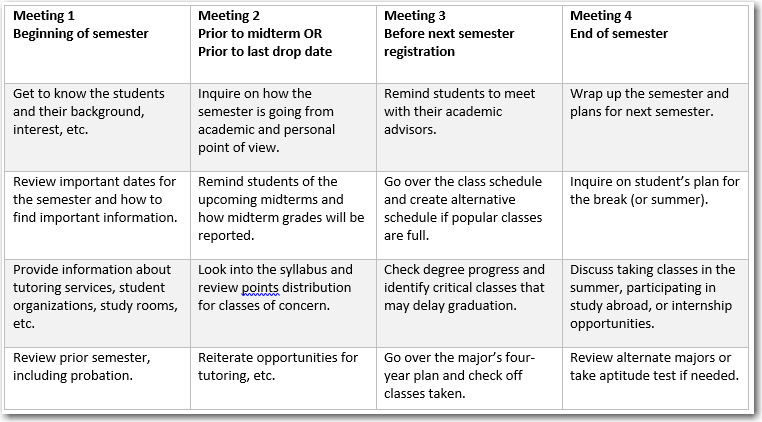 Athletic Advisors should send handouts that share the typical daily schedules of student-athletes before the beginning of each semester to keep all advisors and professors in the loop about times that would be best (and worst!) for scheduling course offerings as well as meetings with advisors. Although many student-athletes enter college with dreams of becoming professional athletes, very few will end up with that career. Among the five major professional sports at the NCAA level, none of the student-athletes have higher than a 9.1% chance of making it into professional leagues, with football student-athletes in particular having only a 1.5% chance of going professional (NCAA, 2017). Thus, the student-athletes, just like the rest of the undergraduate population, need an opportunity and a structure that will allow them to pursue a discipline that they are passionate about, rather than settling for a major that can be fit conveniently into their complex schedule. The academic advice that student-athletes can obtain from their Athletic Advisor is critical, since those advising from an athletic standpoint are more aware of the requirements for eligibility that are crucial for student-athletes, such as meeting NCAA progress towards degree requirements and grade point average requirements. But this academic advice needs to be blended with the advising they receive from experts in their academic disciplines. At Monmouth University, all advisors follow a common academic advising model that includes a separate advising department for all first-year students. In this model, at least three different types of advisors need to be communicating with each other in order to best serve the needs of student-athletes. The number of professionals and departments that need to be in close communication with each other in order to best facilitate the academic progress of student-athletes is a little daunting, but their mission is to provide the best academic advice possible to all students. At this medium-sized, private university, about 9% of undergraduates are Division I student-athletes and they do have priority registration. 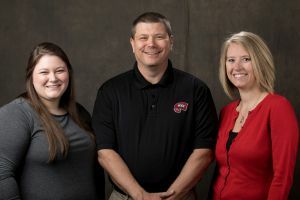 With a Director of Advising that reaches out to collaborate with academic advisors in the departments, advisors strive to provide the same opportunities for student-athletes that are available to the rest of the student body. The authors realize that most colleges cannot go to the lengths that a school like Haverford College (which holds no classes between 4:00 PM and 7:00 PM to accommodate student-athletes’ schedules) has gone to eliminate scheduling problems for student-athletes, but with increased inter-departmental communication, different constituencies can collaborate to assure that student-athletes have an opportunity to obtain their chosen degree in a timely manner. Just as this article has a more nuanced lens on the topic from the collaboration between a professor/Departmental Advising Coordinator and an Associate Athletics Director for Academic Support, the authors strongly suggest working across silos to best serve all of our advisees. Ford, J. (2017, April). The politics of college athletics: Is it all about the money? Presented at the Monmouth University Lecture Series, West Long Branch, NJ. Schneider, R. G., Ross, S. R., & Fisher, M. (2010). Academic clustering and major selection of intercollegiate student-athletes. College Student Journal, 44(1), 64-70. Stapley, J. C. & Kalieta, V. D. (2017, July). Emerging adulthood theory and attitudes toward concussion among female collegiate athletes. Presented at the International Conference on Sport and Society, London, England. Stapley, J. C., & Bieber, T. J. (2017, June). Advising student-athletes: It takes a village. Presented at The NJ State NACADA Conference, Montclair, NJ. Tajfel, H. (1982). The social psychology of intergroup relations. Annual Review of Psychology, 33, 1-39. A quick search of the blended position across institutions reveals that this term describes mostly faculty/administrator positions in advising. Although the blended position is known by various names in different institutions, there is one underlying factor: the incumbents do more than academic advising, while building relationships towards student success. Some of the responsibilities included are academic support and counseling. Our experiences at St. Louis Community College have been successful in implementing a position that meets student needs across multiple offices. This article looks at our experiences with the blended position and why, despite its challenges, it might be worth considering at other similar institutions. At St Louis Community College, management has gone outside the box to include disability services, financial aid, enrollment services, and recruitment. This growing trend varies in scope depending on the institution that offers this position. Ackerman and Schibrowsky (2007-2008) developed the term Student Relationship Management (SRM) describing “relationships that institutional agents (eg., counselors, advisors, faculty members) create, develop, and maintain with students” (p. 21). This definition could partly define the blended position. The lack of definitive information on the blended position in advising indicates a greater need to generate dialogue on this topic and to demonstrate its relevance for institutions today. My experience in a blended position is demonstrated on several levels. I work as the Student Support Specialist for an education center which is part of St Louis Community College. The purpose of the center is to bring educational opportunities to individuals living in underserved areas and to make programs accessible to the community. It serves a population with a median household income of about $10,000, an unemployment rate at almost 23%, and only 55% of the residents holding high school/HISET certificates. Although the center is a much smaller location of the community college, it still offers full college services to the community from academic services like advising and enrollment to the various support services like disability resources and a library. In order to provide these services with its lean staff, management has creatively introduced the blended position to satisfy the varied needs of the student. For example, in lieu of a fully staffed cashier’s office and a slew of enrollment services assistants, the position of the Admissions, Registration and Business Office Assistant was created. The incumbent provides admissions, cashiering, and some campus life services. Another blended position, the Coordinator of Student Services, oversees functions in the departments of the Academic Support Center, the Assessment Center, Campus Life, and also has some advising responsibilities. At St Louis Community college, there are four main campuses and two education centers. The education centers are much more than just satellite locations and so require some ingenuity in staffing. This is where my position as the Student Support Specialist is established. The role has a broad scope encompassing advising, enrollment, financial aid, disability support services, and community outreach activities. Advising. The incumbent’s academic advising duties include advising students on course selection for degree completion and transfer purposes and organizing New Student Registration Workshops (NSRW) for first time in college students. Enrollment. Enrollment services responsibilities are tied in with recruitment. The center’s location is strategically situated in the heart of the city, which makes the center unique in the student population that it attracts. One of the activities the specialist is involved in is mobile enrollment at area high schools. At Saint Louis Community College, we conduct workshops to walk the students through the entire enrollment process. At the end of each session, students are duly enrolled and have schedules for the fall semester. Financial Aid. When it comes to financial aid, the Student Support Specialist provides support with the Free Application for Federal Student Aid (FAFSA), ensures that required college financial documentation has been submitted, and all financial aid deadlines have been met. The specialist is also available to troubleshoot and answer questions about issues that students are having with their accounts. Disability Support. 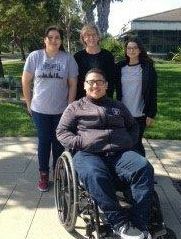 The disability support services performed by the Student Support Specialist involve identifying students requiring support, providing those students with information about the available services, and walking them through the process of receiving the necessary accommodations. These can include anything from providing proctors, readers and writers, extended testing time, to seating accommodations. Community Outreach. This piece of the responsibilities of Student Support Specialist involves reaching out to the community to recruit students to the college. Invitations are accepted by the specialist to attend a host of community events where prospect cards are handed out, completed, and returned for processing. The individuals from these cards are contacted with information about the college and programs of interest. The specialist is also involved in what the college calls Red Carpet events, a major way of opening the college to prospective students. The Center “rolls out the red carpet” by inviting groups of high school students to a pre-orientation event where they are introduced to a typical day in the life of a college student. In my view, the blended position is key to the success of the satellite centers or departments of any institution. This position is worth considering because of its immense benefits to the student and the cost saving measures to the institution overall. A blended position offers one person to walk the student through the full enrollment and financial aid processes. Students have more opportunities to interact with the specialist and so may identify with this individual and feel more comfortable relaying any follow-up questions. This provides continuity and one identified staff person for the student. It creates a “one-stop shopping” experience for the student which cuts down on the “run around” that the students may receive at larger locations, resulting in frustration from repeating their experiences, conflicting advice, and wasted time. The presence of the blended position creates a rewarding and fulfilling experience for the student, resulting in repeat customers who become our word of mouth advertising. The economic benefit here is glaring. Instead of hiring multiple employees, each tasked with a different function, the institution pays a little more to staff the blended position. This is a win-win situation for the institution getting more for its buck and the employee having the ability to earn more. The blended position creates the ability to multi-task. The incumbent can perform several different functions through cross training in different departments, making them a versatile asset to the college. Other employees also receive cross training which makes them flexible and able to assume different responsibilities to cover for co-workers in their absence. The development of this position enables the college to establish itself in various communities and still provide full services. This helps to bring the college to the community instead of waiting for the student to come in to the larger campuses, whose locations may not be geographically accessible to the student. The college is able to serve the community effectively and efficiently. The presence of the blended position enables the college to set up satellite centers where there exists excellent camaraderie among staff due to their close working relationships. This environment develops a feeling of belongingness and a family atmosphere where morale is high and turnover is low. Employees at smaller satellites have a sense of ownership that leads to higher work output. Satellite centers offer smaller class sizes which create great class discussions and an excellent learning atmosphere for students. Students are able to get clarification of material and generate healthy class discussions without feeling the intimidation of the larger class sizes on the main campuses. This concept of a blended position, nevertheless, has its own challenges. Recruiting for this position is not an easy process. It requires an expert in academic advising, financial aid, and access (disability services). If there are any individuals like this, they are few and far between. There is the need to settle for an expert in one area who has general knowledge in the others. This means that there will be an on-the-job training period in the first year or two. Another daunting challenge is the obvious disconnect from the main campus. Although the student support specialist stays well informed by attending department meetings, time-sensitive information like changes in financial aid deadlines that come up between meetings is delayed in reaching the specialist, thus affecting the service provided to the student. Furthermore, implementing this position on larger campuses would only work if advising is implemented on a departmental level. At institutions where the academic advising responsibilities are centralized, there will also be specialists from other departments providing service to the students. Therefore, the blended position would be redundant. In conclusion, the Student Support Specialist is a well-rounded employee and a great asset to the community college. This position supports a lot of different functions at the community college. The specialist manages the relationship with the student from start to finish across departments and allows the university to not only cut down on large staff, but also improve student’s satisfaction, which ultimately improves retention (Bruning, 2002). As described by Ackerman & Schibrowsky, (2007-2008) “Student Relationship Management (SRM) implies a life cycle of recruitment, retention and relationship quality processes” (p. 21). This defines the functions of the Student Support Specialist in its entirety. International students embark on a great adventure. They travel to other countries hoping to expand both their academic knowledge and their knowledge of the world. Adventures can be scary, however, and they can be fraught with the unexpected. Some international students might become overwhelmed with adjusting to even seemingly mild cultural differences, while others may hide their discomfort and attempt to blend in, leading to continued confusion. All international students will feel culture shock at some point and to varying degrees. Advisors who learn to assist students with alleviating and mitigating culture shock can contribute to students’ success and their enjoyment of their time in their host country. In order to do so, advisors must understand the cultural and individual characteristics that influence a student’s experience of culture shock. An anthropologist, Kalervo Oberg, first coined the term culture shock in 1954 to describe the anxiety felt by individuals living in a new culture (Oberg, 1954; Oberg, 1960). He saw culture shock as a disease, as at the time it was common to characterize any discomfort a human felt as being a malady that needed to be cured. For example, social scientists once considered nostalgia to likewise be a disease of loneliness or homesickness (Lowenthal, 1985). Researchers today tend to divide the study of culture shock along four approaches: cognitive, behavioral, phenomenological, and psychological and sociocultural (Chapdelaine & Alexitch, 2004; Searle & Ward, 1990). Many different characteristics affect how a particular individual experiences culture shock, but most can be divided into two main areas: the breadth of difference between the two cultures and the individual’s personality traits. The further the cultural distance between the home culture and the culture of the host country, the more likely it is that an individual will feel discomfort and difficulty in social interactions. Cultural distance is a measurement of the difference between the values and behaviors that are the result of one’s culture, and there have been many studies that have attempted to define the dimensions along which cultural differences can be measured (e.g. De Santis, Maltagliati, & Salvini, 2016; Hofstede & Bond, 1984). An individual’s personality plays a role in how they react to new experiences and the extent to which they are willing to put themselves in awkward situations to learn the new social rules. Shu, McAbee, and Ayman (2016) explore how personality traits affect cross-cultural adjustment among international students in the U.S. Their research supports the idea that individuals with personality traits such as extroversion and conscientiousness are likely to adjust more easily to new cultures. Chapdelaine and Alexitch (2004) offer several insights to help international students adjust to life in their host country. Their study tested the following variables as predictors of international students’ adjustment to life in another culture: family status in host country, previous cross-cultural experience, and degree of social interaction with hosts. Their results show that international students who have greater social interaction with natives of the host culture will have the greatest levels of adjustment to the new culture. They will learn the social rules and expectations quickly and develop supportive relationships that allow them to experience less culture shock. International students who bring family with them, such as their spouse or children, have the least interaction with their hosts and experience more culture shock for a longer period of time. Interestingly, the study found no effect of previous cross-cultural experience on culture shock. Although certain personality traits can help students adjust more quickly, they do not prevent the experience of culture shock all together. Oberg’s (1954) anthropological discussion of culture shock identified four stages of cultural adjustment that describe the process that people go through when they are adapting to a new cultural environment. Being aware of these stages can help advisors identify intervention points and strategies for helping students. It is useful to consider this process of adjustment when working with international students at all stages of their U.S. academic careers and to understand that the time it takes each student to move through the stages will depend on how an individual student is affected by the two factors discussed above: cultural distance and personality. The Honeymoon Stage. This stage is an exciting time when individuals explore new cultures, but involvement in the new culture is superficial and tourist-like. Students in this stage are excited to be in a new country and may neglect their studies as they explore their new environment. They will seem happy and adjusted and may not anticipate difficulties ahead. At this stage, advisors can prepare students for what they might experience and create opportunities for them to begin learning the new social rules as quickly as possible. It may help to assure students that everyone experiences culture shock and that an advisor will be available to assist them when problems arise. The Culture Shock Stage. Stage two is characterized by irritation and frustration with the differences between the home culture and new culture. Cultural differences in communication styles and emotional expression can expound the problem and make it harder to recognize students having issues. Advisors may find it difficult to engage students in this stage. Guo (2016) provides excellent strategies for building trust and engaging international students. In some cases, advisors may need to direct students to international student services or counseling resources on campus. Advisors should also continue to provide opportunities for international students to interact with native students to increase their social experiences, allowing them to move to the next stage. The Gradual Adjustment Stage. In stage three, the gradual adjustment stage, individuals begin to learn more about and understand their host culture. They also tend to idealize their home culture, and they may initially make fun of values and behaviors that are different from what they are used to. However, as they gain a deeper understanding of the new culture, they also gain a deeper respect for their host country. This process is gradual and longer than the other stages, and it may contain many ups and downs. Students need to learn new strategies for dealing with stress and loneliness without the support structures they are used to at home. Advisors can recognize students in this stage because they will want to talk about the differences they have noticed and share stories about their experiences. Listening to students’ concerns and empathizing with their attempts to understand can help them adapt. The Adaptation Stage. Eventually, most individuals who spend a considerable length of time in a new culture will reach the fourth stage, that of acceptance and adaptation. They are no longer negatively affected by differences in culture and can participate in social interactions without difficulty. Students who have reached this stage can assist advisors who are working with students who are still experiencing culture shock by acting as ambassadors or peer counselors. Advisors need to be aware of international students’ level of adjustment to their host culture. Culture shock will affect their behavior and whether they seek help when it is needed. Advisors should encourage international students to have as much social interaction with native students as possible and can help develop programs and events to facilitate such interactions. International students often seek out others from their own culture for support in an unfamiliar environment. Joseph and Baker (2012) found that Caribbean students studying in the U.S. reported feeling less culture shock when they had other students from their home country to create a sense of community. However, relying on a community of people from their own culture can cause students to remain in their comfort zone, preventing them from becoming acculturated to their new environment. The more international students find occasions to interact with native students and others in the host community, the more quickly they will conquer the impediment of culture shock and the more success they will have as international students. Learning to recognize the stages of culture shock will help advisors assist students with moving through the process of adapting to their new environment. Chapdelaine, R. & Alexitch, L. (2004). Social skills difficulty: Model of culture shock for international students. Journal of College Student Development, 5(2), 167-184. De Santis, G., Maltagliati, M., & Salvini, S. (2016). A measure of the cultural distance between countries. Social Indicators Research, 126, 1065-1087. Rokeach’s value survey. Journal of Cross-cultural Psychology, 15(4), 417-433.
of culture shock. College Student Journal, 46(4), 716-730. Lowenthal, D. (1985). The past is a foreign country. Cambridge, U.K.: Cambridge University Press. Oberg, K. (1954). Culture shock. (Bobbs-Merrill Reprint Series in the Social Sciences, A-329). Indianapolis, IN: Bobbs-Merrill. Searle, W. & Ward, C. (1990). The prediction of psychological and sociocultural adjustment during cross-cultural transitions. International Journal of Intercultural Relations, 14, 449-464. In recent years, it has become increasingly important for academic advisors in Japan to be adept at advising students who wish to study abroad. Moreover, academic advisors should also encourage students who do not wish to study abroad to do so. Fewer Japanese students have participated in studying abroad than in years past, despite the rapid globalization of Japanese society and the rest of the world. According to the report by the Organization for Economic Cooperation and Development (2017), as many as 82,945 students from Japan studied abroad in 2004, while in 2011, only 57,501 did so. In 2014, the number dropped to 53,197, according to the latest statistics from the Japanese Ministry of Education, Culture, Sports, Science and Technology (MEXT, 2017). MEXT aims to ensure a minimum of 200,000 Japanese students study abroad by 2020. To make that happen, MEXT gave huge subsidies every year in the amount of 20.6 billion yen (or 184 million U.S. dollars) to major colleges and universities in Japan for scholarship purposes from 2007 to 2014 (Yoshida, 2015). What is behind the decrease of Japanese students studying abroad? Many argue there are three major reasons. First, there has been a decrease in the population of younger generations each year. Second, the younger generation is becoming more introverted, and members of this generation tend to show more reluctance about studying abroad when compared with previous generations. Third, the Japanese economy has been shrinking every year, and as a result, many families cannot afford to send their children abroad to study. Though these plausible reasons are found in every journal and newspaper currently published in Japan, this article rejects them and presents another possible reason. This reason calls colleges and universities to action so that they can develop better outcomes through advising Japanese students who wish to study abroad. It is a rather easy task to show that the above-mentioned reasons for the drop in students studying abroad, which are believed throughout Japan, are not true. First, though it is true that Japan has experienced a recent decrease in the population of younger generations (Ministry of Internal Affairs and Communication, 2017), the annual difference in students is not as big proportionally as the decrease in students studying abroad over ten years. In addition, the number of college students each year has been comparatively stable during the last decade (MEXT, 2016). Second, no evidence suggests that the younger generation is, in fact, more introverted than the previous one. On the contrary, dozens of colleges and universities in Japan have started new schools or departments that are labeled either “international” or “global” to attract more applicants, and do so with much success, judging by the number of applications they receive annually. Third, though it is true that the Japanese economy was shrinking until 2009, since then, and since the current Abe regime took over, every economic indicator—such as the unemployment rate and the GNP—has improved annually. Furthermore, though the amount of subsidies from the government for scholarship was, in total, 3.4 billion yen from 2004 to 2009, the current Abe regime dramatically increased that amount to as much as 17.2 billion yen during 2010–2014. The fact is, however, that the number of Japanese students who study abroad still continues to decrease. The true reason can be summarized as the progress of diversification and maladjustment to globalized circumstances, which is all about academic advising. So, what happened to the academic advisors who worked for the Japanese colleges and universities? To put it simply, they were unable to catch up with the reality of the situation. Because the needs of the students have become more and more diversified in terms of studying abroad since the early 2000s, the need for academic advisors in Japan increased too much, and unfortunately, it was more than the advisors could handle. For example, until the mid-1990s, most Japanese students considered the U.S. and the U.K. their only realistic destinations for studying abroad because they all wanted to study English. However, with the rise of the Chinese economy in the mid-1990s, many Japanese students have gone to China to study its languages and culture. This also applies, though to a smaller extent, to other Asian countries—such as Korea and Thailand—and therefore, the destinations for Japanese students to study abroad have become more diversified compared to the 1980s and early 1990s. Due to rapid globalization and the immense opportunities to learn from institutions abroad, the motivations of Japanese students who study abroad have also changed. Today, some want to study traditional art and filmmaking in Korea, whereas others want to develop advanced techniques in soccer in Spain or in Italy. Others want to learn more about state-of-the-art architecture design in Finland. As a result, the number of Japanese students who studied in the U.S. dropped from 46,872 in 1999 and 2000 to as few as 19,060 in 2015 and 2016 (IIE, 2016). It is also important to understand that most academic advisors who work for Japanese colleges and universities have not studied abroad themselves. Therefore, they cannot share any international stories with their students. They cannot share up-to-date information about studying abroad with students either, because professional development opportunities in this field are very limited in Japan. This is exactly what the statement “progress of diversification and maladjustment to globalized circumstances” means. What should be done for academic advisors in Japan? One of the best solutions is to provide them sufficient professional development opportunities in terms of studying abroad. Baker, Brake, and Davis (2017) share that “many higher education professionals are expected to have specific competencies and skills when they begin working with students, but are only able to gain these skills after beginning their career” (para 1). According to a survey of professional academic advisors, 74% consider support for professional development activities the most valuable reward to them over increases in pay (Drake, 2008). The good news is that Japan has many good teachers who can explain studying abroad, many of whom are professionally certified study abroad counselors and have studied abroad themselves. As of today, the number of these counselors is at least 1,132, though most of them are not currently working at colleges and universities (JACSAC, personal communication, July 19, 2017). For example, some work at private travel agencies, while others work at nonprofit organizations for international exchange. Regardless of their workplace, however, they are all members of the Japan Association of Certified Study Abroad Counselors (JACSAC), established in 2009. JACSAC is the only professional organization in Japan that administers a test to prospective counselors and members and provides a series of regular professional training sessions for certified counselors who pass the test. While advisors are welcome to participate in JACSAC training, most do not because they are not interested in the training, lack the information on training opportunities, or fear that with additional training they would be transferred to a different place in the institution. The JACSAC training sessions are conducted at least once a month, and the themes include the Travel Agency Act in Japan, the education system in the U.S., a variety of official English tests, and detailed and specific country reports. Professional certified counselors have a number of opportunities to grow in their field, thanks to their daily job functions and JACSAC training programs. Interesting research was conducted in 2014–2015 by the Japan Association of Overseas Studies (JAOS), which is the parent organization of JACSAC and was founded in 1991. JAOS now contains 65 travel and study abroad agencies, including the Australian Embassy and the British Council in Japan. Research showed that as many as 64,988 Japanese students and young business persons went abroad to study (JAOS, 2016), taking advice from professional and certified study abroad counselors in 2014–2015; approximately 20% of them were high school students. Though the number may partially overlap the 53,197 students who studied abroad in 2014, as mentioned previously in the Education Ministry’s statistics, JAOS insists that the majority of the 64,988 Japanese were independent. The problem is that academic advisors who work at colleges and universities do not have opportunities to interact regularly with these professional and certified counselors working in the private and nonprofit sectors. They have been segregated from each other. One solution to this problem would be to create a forum in which both academic advisors and certified study abroad counselors can exchange their views and experiences. When that happens, they will learn from each other. On the one hand, academic advisors will acquire a variety of up-to-date information about study abroad programs in dozens of countries. On the other hand, certified study abroad counselors will learn about the current situation with college students and determine how to incorporate study abroad programs into the university curriculum in a more seamless manner. They will also be able to give advice for degree planning, which is crucial to remain on track for graduation (Malmgren & Galvin, 2017). The forum could be either an academic or professional association that, for example, holds an annual conference where every member can exchange views and experiences with other members, particularly with members who have different backgrounds. Neither the JAOS nor the JACSAC have published a journal where every member’s personal views and experiences can be included and shared for all other members. Therefore, that should be also one of the expectations for the new forum. Baker, R., Brake, K., & Davis, K. (2017, June). Enhancing the advising profession through internships. Academic Advising Today, 40(2). Drake, J. (2008). Critical concepts in advisor training and development. In V. N. Gordon, W. R. Habley, & T. J. Grites (Eds. ), Academic advising: A comprehensive handbook (2nd ed., pp. 396-412). San Francisco, CA: Jossey-Bass. 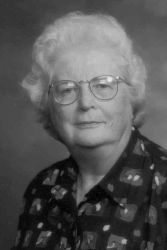 Malmgren, J., & Galvin, J. (2006, September). Effective advising for study abroad. Academic Advising Today, 29(3). Yoshida, A. 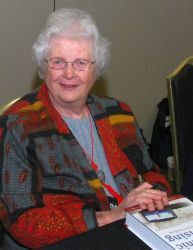 (2015, February). Global jinzai ikusei no kukyo (Emptiness of nurturing global talents). Chuo Koron, No. 2. Tokyo, Japan: Chuo Koron Shinsha. When I began to advise students on my own, I recall one of the most impactful moments on my young career. I had just met with a student who was having a very serious concern about her graduation timeframe and remaining coursework. At the end of our session, we had developed a game plan and she felt so much more at peace about what she had to do to earn her degree. As she left my office, she turned around and stated, “Vince, this was one of the best advising sessions I have ever had. You really helped make everything seem so easy. Thanks!” For a relatively new advisor, that moment really opened my eyes about the impact I could have in this profession. I felt on top of the world, like I could do no wrong. The thing about that situation is that everything I did was based on what and how I was trained. If every appointment, every day, and every year could be like that moment, this was going to be the most enjoyable and least stressful career I could have hoped for. The reality is that no job is that perfect. In the advising profession, advisors strive to have a positive impact each and every day. To some, advisors can be viewed as heroes because we find ways to solve complex problems that have no simple solution. Advisors tend to wear a wide spectrum of hats, all while fulfilling our day-to-day primary responsibility of helping students grow and develop—not just as scholars, but as individuals. One of the hardest things advisors typically face is the notion that advisors cannot always be the hero. As advisors, we want to help and we want to make things as easy as possible. Yet, there are so many things that are just beyond our control. Think about this for a moment: how often during the registration season do advisors receive emails or conduct advising sessions with students who are trying to get a perfect schedule—either based on specific courses they want to take, specific times that would fit with their ideal work schedule, or perhaps just so they have no Friday classes? These students have been unable to craft their flawless schedule because classes are full or there is an unusual shortage of particular courses. Every now and then, underclassmen may ask advisors why they are not willing to help them enroll in a majors-only course even though they are planning to complete their missing 30 hours of lower level coursework at their local junior college over the next three summers. One thing that I try to warn any advisors that I train and/or mentor, while also reminding myself, is that no matter how good of a person you are, no matter how good your intentions are, no matter your reputation as an advisor, you will not please everyone. When advisors work with students, it is easy to say, “Yes I can do that for you.” However, it can be harder to tell a student “no.” When an advisor tells a student no, it can come across as negative or as the advisor simply not wanting to make a student’s life easier. However, telling a student no could also be the best thing an advisor can do. Here is a good example. It can be easy to try and force a first semester sophomore into a majors-only class that is typically reserved for juniors and seniors. However, advisors have to also examine potential negative effects of that course of action. Perhaps the advisor would be taking away a seat from someone who needs it because they are closer to graduation. Perhaps the advisor would be enabling a student to avoid taking a core class that they have already been putting off for two years. As advisors, it is critical to always remember that advising is a form of teaching. Advisors must not be afraid to help students have teachable moments. It is in those moments that advisors can help students grow and develop. I recall a student who was frustrated with me because I would not force her into a majors-only course because she had not completed either of our two required math courses. She did not understand why I could not help her when she was planning to take both math courses 12 months later back at her hometown. We proceeded to discuss my reasoning, but more importantly, we discussed her plan to save her math courses. She began to see the risk involved when I shared with her that by proposing to save six hours of a subject that she had concerns with taking at our institution, she was basically causing her potential graduation to hinge on passing both courses at the same time in her final semester. We then began to talk about making more of an effort to take the classes sooner rather than later and what I could do for her fall schedule if she kept in touch as her summer grades were posted. Some advisors may also play a critical role in the probation/dismissal process within their respective departments and/or colleges. During an appeals process, a student may disclose to an advisor that they have been going through some physical, mental, or emotional circumstances and that has been the primary reason that their academic performance over the past one, two, or three years has not been in good standing. Of course, advisors want to help a student remain on track to graduate in a timely matter. Yet, advisors also care about their students holistically. Sometimes the best thing we can to do to help students is to help them understand what it means to put themselves first—even if that means they need to take a break from school in order to do so. Students are told in a variety of ways that their academics are their primary responsibility. There is truth in that statement. However, advisors strive to help students gain an opportunity to learn about navigating their responsibilities and needs as an individual. Advisors are often the ones who tell a student, “Maybe working three jobs and taking 16 hours is not a good idea.” I still recall working with an individual last year who had been dismissed for a semester and had been going through severe depression and anxiety for as long has he had been in college. Upon being readmitted, he shared that the dismissal was the best thing that could have happened because it forced him to put his health and well-being first. That statement was so powerful that I continue to share it when I meet with a change of major or first semester student. Advisors should never hesitate to share with our students that not only do we care about a student’s success and their development, but we also have a genuine concern for their well-being. In this profession, it is easy to become emotionally attached to our students. In my opinion, there is nothing wrong with that. Our emotions make us who we are. Many advisors strive each and every day to help make the lives and experiences of our students as easy and fulfilling as possible. College, like life, can be a series of peaks and valleys. Just like in life, our students can learn and grow just as much, if not more, from the hard times in college as they do in the good times. It can be really easy to throw our students a life-line to help get them out of the valley that there are in. However, advisors can also have a profound impact by simply giving students a map on how to navigate out of their valley and back to where they want to be. It might not be a quick solution, but it could very well be a journey that helps them grow and develop in ways they never thought they could. To me, that is pretty heroic too. When I was a child, one of my favorite books was P. D. Eastman’s Are You My Mother? The uncertainty of the baby bird coming into the world alone, the irony that he passed by his own mother because he did not know what she looked like (“She’s right there!” I would exclaim, pointing at the mother bird pulling a worm from the ground as her baby bird passed by, unawares), and the sheer terror of the “Snort!” all captivated me. Imagine, his mother was right there—right there—ready to help and guide, but he did not even know it. I often read that story to my own children, and after years of being a full-time mom and a part-time adjunct, I was hired as an academic advisor. My master’s degree and years of teaching in colleges and universities certainly made an impact on my director’s decision to hire me; however, my experience as a mother truly shapes and informs my role as an advisor. I have witnessed adult learners, lost in a confusion of terminology and requirements, freeze and retreat. Open and frequent communication is necessary, but hovering can be problematic. Much like letting young adults spread their wings, an advisor needs to be alert, offering assistance when necessary, but knowing when to let the student “learn the ropes” of academic life to ensure they become strong, independent learners. Walking with the non-traditional student through the tangle of regulations regarding the admissions process is the first step to their successful future. For adult students, who have often been away from an educational settings for years, the jargon in college catalogs, the computer systems that deliver course content, and the mailings from campus offices can appear foreign and confusing. Let’s face it—wading through the morass of baccalaureate degree requirements is a daunting task. My students remind me of this when we meet for advising sessions. Cassandra first came to us with hesitation and a dream. With a faltering voice and a self-deprecating laugh, she admitted that when she had taken classes at a community college years ago, she had not realized how important grades were. As a working adult, she had recently decided on a future: she wanted to become a teacher. Working as an aide in a middle school classroom, she had grown to love working with children. Cassandra was full of ideas about how she would approach teaching, and she realized she wanted to be a head teacher with a classroom of her own. She had the drive to succeed, but when she approached us about moving forward, she learned her GPA did not meet our university’s minimum requirement. Cassandra knew her GPA for past coursework was low, but she never thought it would be a barrier for her if she wanted to achieve her goals. Cassandra saw a roadblock and started to think her future would never happen, but with encouragement, and reminders about how passionate she really was about becoming a head teacher herself, she began to consider options. Since she had already earned many college units, and her GPA was not far below the minimum requirement, I suggested she move forward with an appeal to university policy. Letting students know we here to help and guide them is the first step. Finding a way to navigate around institutional barriers is a key component of an advisor’s role. Filing an appeal, as we did for Cassandra, is one approach that can work, but there are other avenues that lead to positive outcomes. After years spent taking classes (some successfully, others not so successfully), at a number of community colleges, Ted stopped by our campus, armed with various transcripts and one question: Could he earn a bachelor’s degree in our accelerated adult program? He had puttered around enough, he felt, and now, with real resolve, he was ready to begin a bachelor’s program. Was the university willing to overlook his low GPA and give him a shot at success? In Ted’s case, the numerous transcripts were riddled with failed classes and course withdrawals. He had not earned a solid foundation of units, and his GPA was very low. Undeterred, I began to talk to him about returning to the local community college, this time under my advisement, so that he could get back on track and raise his GPA enough to qualify for our bachelor’s degree programs. Since he had decided that he wanted to go into business, we crafted a clear path forward—with courses in accounting and economics—courses that interested him and that he would need for his bachelor’s degree. It is a boon to adult students when a university is flexible in accepting testing units through CLEP or DSST or when they allow students to earn general education and lower-division units at community colleges. Portfolio assessments for prior learning offer incredible potential as well, and for adult learners who are trying to do it all, having an advisor guide the way is essential. Adult students who have their “Eureka!” moment often appear in our advising office, ready to dash off to realize their goals. Fueled by a new sense of purpose, and a realization that they have waited a bit longer than others, they are sometimes over-eager to get started. Reminding the students to pace themselves is important. Since adult learners are often working parents, there are work and family demands that must be met. Advising a student to start off slowly, with just one course, maybe two, during their first term back can be difficult. The passion to move forward is real, but a potential setback from an overburdened course load can be a catastrophic failure for an adult student. While a younger, traditionally aged undergraduate may shrug off a bad semester, adult learners will often give up and stop trying. Just like a parent keeping an eye on things from a bit of a distance, the advisor should be watching and guiding their adult learners to ensure success. And when thing are very broken, can an advisor fix them? Jose approached us after being academically disqualified from another university. A few months had passed since he had first received the news, and the ramification of the finality of disqualification had settled in by the time he came to us. Jose’s plans for his future had been cut short by his admittedly immature attitude toward his studies. There had been a few family issues that had cropped up that distracted him from his grades, but he had not realized how significantly his GPA would be affected, nor how the action of disqualification would impact him over time. Would we consider admitting him to our adult program? Time was necessary for Jose. Being patient and waiting out a year was a challenge, but learning patience is a virtue. Time helped him understand the value of a college degree. While in the past he had been dismissive of his degree program, his year of waiting solidified in him the knowledge that a bachelor’s degree was something he really wanted. After a year of waiting and then going through the admission process, he came to the advising office so I could help him register for his first class in his new degree program. “Yes!” he said softly as he pumped his fist in the air. He was back. That is the goal, isn’t it? To help adult learners not just earn the degree, but to have a new-found sense of self? It is a lot like what a mom does; I am convinced of it. 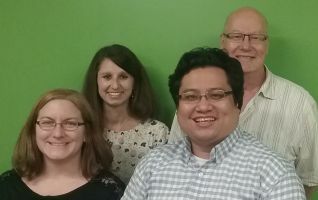 This spring I enrolled in BIOL-N100, a general education course typically taken by first-year students at Indiana University–Purdue University Indianapolis. Only minutes into the first lecture, I realized I would learn more than how the cellular, tissue, and neurological systems in my body function; I would learn what it is like to be a college student in a way I had not experienced in over ten years. I decided the front of my notebook would be dedicated to biology notes and the back would be reserved for my anthropological-style observations about my fellow students, the classroom environment, and my personal challenges in this large, lecture setting. For those who are not a nerd like me and do not want to take BIOL-N100, allow me to share three things I learned from my biology class. If the classroom were a cell, the professor would be the mitochondria. Mitochondria are the "powerhouse of the cell," meaning this is where the cell's energy comes from. I believe meaningful learning thrives when facilitated by a passionate instructor. My professor connected biology to our everyday lives, shared his passions (such as his love of Japanese culture), and joked during his lecture when possible. He did everything he could to engage, but this traditional, lecture-style course was most beneficial for auditory learners (which I happen to be). Like so many courses students take, there were times when class was a little boring, and I even dosed off once—but more on that later. I gained appreciation for the challenges faculty face after having coffee with my instructor at the end of the semester. He wants to engage and has tried a variety of group work and other hands-on activities. Unfortunately, he has seen little positive reaction from his students, and implementing these methods requires him to remove other valuable content from his syllabus. This conversation with the instructor was empowering. I feel more confident explaining lecture courses to my students, how beneficial it is to build a relationship with the instructor, and the challenges that their professor may face in and out of the classroom. I often tell my students, "It's a marathon, not a sprint," when it comes to succeeding academically; I discovered this is also true for professors. We maintain homeostasis, but when knocked off balance, it is hard to get back on track. As humans, every cell within our bodies is constantly adjusting due to a system of feedback controls that maintain homeostasis, an internal regulation despite conditions which may be changing outside. In a perfect semester, students’ lives will do this as well, yet we know internal and external factors can steer them off course. Each year I tell students the same things about academic success: go to class, read the chapter beforehand, communicate with your professor, attend tutoring sessions, etc. Unbeknownst to me, my empathy has slowly decreased for students who did not study or attend class enough; I sometimes find that I begin addressing these behaviors without fully listening first. 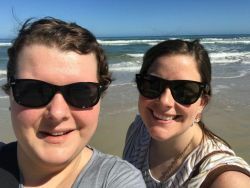 Mid-way through the semester, I got a reality check when two of my friends experienced tragedy: one’s husband suddenly passed away and the other’s father died after battling dementia. I stopped doing the reading, let alone studying for my upcoming exam. Moreover, the night before I fell asleep in class, my husband, infant twins, and I arrived home from Chicago at midnight after my grandma's 90th birthday party. Both of my babies were sick, and I was close behind. Most importantly, my mind was consumed by my friends’ struggles. These are explanations, not excuses, and I felt terrible for disrespecting the professor by nodding off for a few minutes. I realized that if this could happen despite my sincere engagement in the course, then it is no wonder so many students do this while taking several classes, working, or managing their own families. The next time a student is willing to share their challenges with me, I will try to not see it as "complaining," and instead will listen intently. We should be like DNA and RNA and replicate the student experience. When cells divide, DNA duplicates many times. The double helix unwinds, creating two templates for new strands of DNA. The enzyme RNA polymerase attaches to DNA and makes a copy in the form of messenger RNA, which carries information to the cytoplasm to direct the production of proteins. More often than not, every strand of DNA is perfectly replicated thanks to RNA polymerase, and I believe we will be better advisors if we do the same. listen to students’ stories and replicate their unique experiences. I will not tell my final grade, but I will admit that the grade I would have given myself as an advisor prior to taking this course would have been artificially high. I now see the continued effort I need to put in so that I can be truly helpful to my students, and I have a newfound respect for the challenges they and their professors face. Across the country, college campuses are undergoing transitions, and Young Harris College (YHC) is no exception. YHC has experienced a host of changes that come with growth and advancement. Over the past decade, YHC has had two changes in presidential leadership, a substantive change (going from a two-year to a baccalaureate granting institution), faculty turnover, the creation of the Student Success Center (SSC), two Vice Presidents of Academic Affairs with different philosophies, and a new Vice President of Enrollment Management. In 2016, YHC’s new strategic plan recommended an assessment of advising potentially leading to a change in the campus advising model. In preparation, Jaime Miller (Director of the SSC and my supervisor) and I attended the NACADA Advising Administrator’s Institute in February 2017. Our goals were to craft a plan to assess advising across YHC’s campus, draft potential advising models that could be deployed after assessment, and define ways to further refine advising at YHC. A NACADA institute is nothing like an annual or regional conference. Institutes are smaller and more intimate with colleagues from across the country coming together to talk through similar challenges and triumphs. This small community feel fosters a unique environment where advisors work together to develop solutions and share effective practices. In my experience, advisors are problem-solvers, and that held true for our cohort. The open discussion format of the sessions allowed participants to exchange ideas for a truly beneficial experience. Each morning, institute faculty provided us with materials and a positive direction for the day. NACADA Executive Director, Charlie Nutt, led morning rallies that pushed us to think both broadly and deeply about our students and their unique needs at our home institutions. His discussions focused on advising and best practices. While his words, quotes, and themes were familiar, we were implored to push the field further. Charlie is an exceptionally talented speaker and leader, and his ability to inspire is boundless. He motivated me to think about the work I was doing on my campus and how I could improve upon it to provide students with a better experience. Although it was not one of my original goals, I was inspired to create an advising syllabus for YHC advisees and was able to act on this immediately. The new syllabus will be used with our fall 2017 cohort of students to better inform and educate them on the expectations and learning outcomes of advising. The most valuable session of the week was the opportunity to work one-on-one with the knowledgeable faculty at the institute. I could not have asked for better mentors. Faculty member Casey Self provided Jaime and I with many good ideas, while still giving us room to talk through our own thoughts. He gave us great advice on how to assess advising in a fair manner across campus. We already knew we wanted to hand off our plan to someone not associated with advising, but Casey mentioned we should add focus groups to our list. We took the opportunity to brainstorm potential campus groups such as the Student Government Association, faculty advisors, professional advisors within our center, department chairs and deans, and the Registrar’s office. Casey’s advice was invaluable to our planning efforts. We found support and advice of a different nature from faculty member JP Regalado. Casey’s advice was focused on our programmatic needs, while JP allowed us to share our personal professional challenges and give us encouragement and advice. I have had the pleasure to work with JP in the Emerging Leader Program (though he is not my mentor) and have always found his advice to be wise and thoughtful. His gentle compassion and pure concern for our needs were so important to our experience. JP was willing to just listen and offer kind words of support to us as professional colleagues in the advising field. While at the institute, Jaime and I created several different strategies that we could take back to YHC. We agreed that in order to determine all of the gaps, we needed to assess advising across campus. We wanted to provide our Institutional Research office with the most appropriate questions about advising based on nation-wide best practice. I researched questions using the NACADA Clearinghouse and reached out to my NACADA network of colleagues. In addition to crafting an anonymous survey, we determined which focus groups could help us gather needed data. Finally, we realized that YHC has already collected useful data that could be used to look holistically at our advising practices (e.g. College Student Inventory and National Survey of Student Engagement data, a recent faculty advisor survey, student satisfaction surveys, and the Dare to Declare survey taken when sophomore students declare their major and transition to a faculty advisor). Combining all of this separate data would allow campus leadership to get a broad picture of the campus-wide advising experience at YHC. With a plan for assessment in place, Jaime and I returned to campus and created important documents to provide necessary background information for assessment for YHC campus administrators. I wrote a brief history of advising at the college and identified cracks that have appeared in the system over the past five years. Further, we added a document listing all of the improvements already in progress (e.g. an advising syllabus, student learning outcomes, etc.). Once we created these documents, we scheduled a meeting with the appropriate campus contacts to begin moving forward. We met with YHC’s Vice President of Student Affairs and the Chief of Staff (who also serves as our Institutional Research resource) in early May 2017. Both of these campus partners were understanding and excited to help us improve the quality of advising on campus. The Chief of Staff agreed to conduct an assessment of advising during the fall of 2017. I look forward to future phases of assessment where campus stakeholders can meet and create a plan for positive change for all YHC students. Jaime and I were fortunate to have met all of our goals while at the Administrator’s Institute, and I am grateful for the opportunity. Without the guidance and conversations I experienced, we would not have been able to create such a holistic and thorough assessment plan. I feel confident now that when the time comes, we will be able to help our campus create an advising model that will better support the needs of our students. I cannot overstate how helpful the Administrator’s Institute was for us. If you have the opportunity to attend, please take the time to attend this valuable institute. The 2017 NACADA Assessment Institute Scholarship came to my attention when I had just switched career track within higher education from student learning outcome assessment to academic advising. I jumped at the opportunity to apply for the scholarship, hoping that the institute could help me establish some connections between assessment and advising. I am not a newcomer to either of the fields because I had done academic advising for six years and then worked as a Director of Assessment for another six years. Still, I had a lot of questions for the specifics of academic advising assessment. For example, how does advising assessment differ from student learning outcome assessment? How is advising related to teaching and learning in both theory and practice? The office I am working at just completed a satisfaction survey of advising services; Can the results of a satisfaction survey be used for assessment? Can advising assessment be done without clearly articulated goals, objectives, and outcomes? The list of questions on how to connect the two fields grew longer and longer. The institute turned out to be a wonderful opportunity to guide me in searching for answers to all my questions. I benefited so much from learning its curriculum, being guided by faculty members, and networking with like-minded colleagues from across the country and abroad. Eventually, it all comes down to making meaningful connections. The curriculum of the institute is well structured, yet flexible enough to fit the needs of the many attendees with diverse backgrounds. There are presentations and materials regarding key concepts and theories, such as the NACADA Pillar Documents and the NACADA vision, mission, and strategic goals. There are also concurrent sessions and work group sessions about best practices and key components of assessment processes. Depending on their needs for either theoretical instructions or pragmatic guidance, the attendees could choose from a wide variety of sessions in which to participate. During the institute, I benefited the most from the work group session on advisor process and delivery outcomes, which I think, covered a key difference between student learning outcome assessment and academic advising assessment. I brought back a thick package of materials from the institute and found myself applying the various materials in the packet very often in my daily work. For example, the office I work at is in the process of creating our own advising mission, vision, and goals. Naturally, I have been using the materials in the packet as guidelines and handouts. The faculty members I worked with were all well versed in both advising assessment theories and practices. More importantly, they were very friendly to work with. I asked many questions and always got good answers from them. Beth Higgins even sent me follow-up materials after she went back to her campus. The institute set up was also very conducive for attendees to have easy access to all the faculty members and the NACADA leadership team. I remembered that during the annual conference, I could only watch the leadership team from afar as a newcomer. But at the institute, I got to chat with quite a few members of the leadership team at the various receptions, luncheons, and even during coffee breaks in the hallway. As a very new NACADA member, I learned about the career paths of several senior, distinguished NACADA members and got to know several new NACADA initiatives. Another highlight of the Institute was the networking opportunities with like-minded colleagues from across the country and even abroad. The setting of the institute was such that it enabled the participants to have meaningful interactions among ourselves. Each session was small enough that I could have an in-depth discussion with other attendees regarding the best practices on our campuses and exchange information on everything advising. At one time, I asked a question to the whole room, and most of the fellow attendees in the room offered some advice, which was useful and insightful. An unexpected and yet very interesting encounter was meeting a delegation from the University of Electronic Science and Technology of China (UESTC) in Sichuan, China. From them, I learned about the recent development of academic advising in China and exchanged ideas of promoting some NACADA literature there. NACADA Executive Director Charlie Nutt (2004) stated that, “The first and often overlooked step in assessing academic advising is the development of an institutional mission for academic advising.” If intuitions are not intentional and systematic in articulating the overall mission and goals of academic advising, both the process and the outcome of advising assessment will be fragmented or inconsistent. The investment of time and energy in clarifying the overall purpose that the whole advising team agrees upon will result in renewed focus and concerted efforts by the team. It has been several months since I came back to Rutgers University with all the inspirations, notes, and materials from the Assessment Institute. The exposure to the rich NACADA literature gave me a solid foundation in starting some assessment initiatives on my campus. My proposal of establishing a new vision/mission/goal statement for our office, a complex structure with multiple campus locations, was already adopted and even the funding for the initiative is in place! I am also using some of the information I learned from the institute in my programming initiatives, such as the handouts on how to create an advising syllabus. The steps taken were small, but my colleagues were very enthusiastic and believed that given some time, there would be concrete assessment results. The Assessment Institute has been a pivotal moment for me to make meaningful connections between assessment of student learning outcome and assessment of academic advising. The networking opportunities with colleagues were invaluable. I am confident that I will have more long-term impact to report back in a few years’ time.